January | 2010 | "A Place for Learning"
Today is the last day of Winter Sale listing. The sale will continue until Monday, February 1. Just email me at kwalker@doubledogdesigns.com if you would like to purchase any of the sale items. 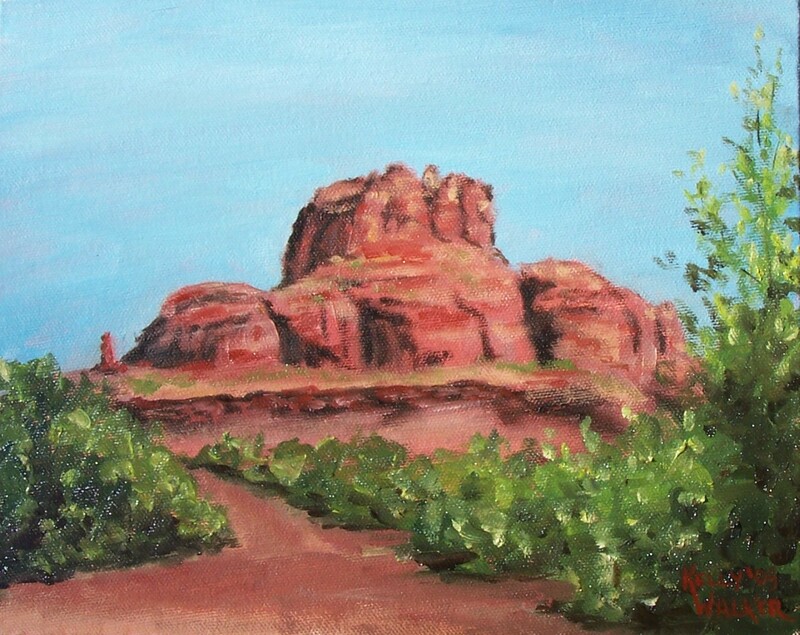 Sedona’s Bell Rock is an oil on 8″x10″ canvas and is on sale for $95. 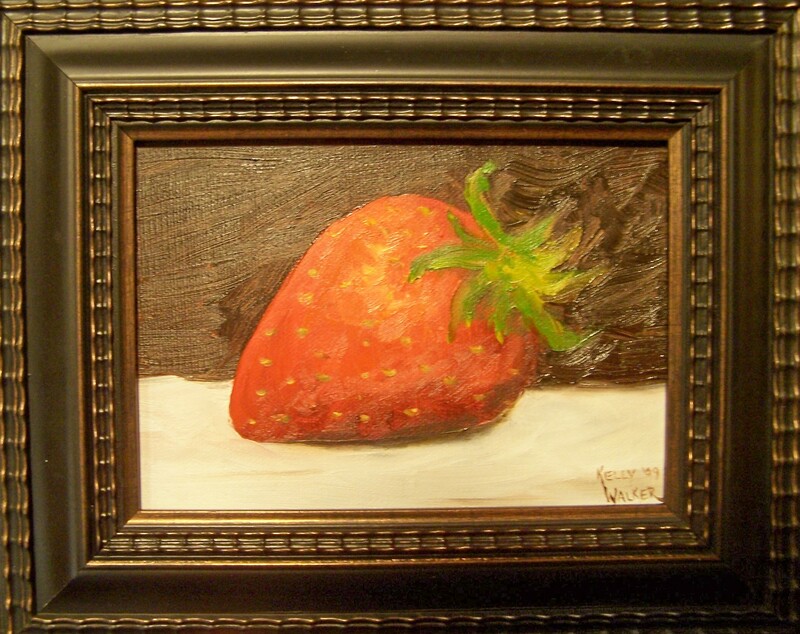 A Red Strawberry is a 5″x7″ oil painting on canvas. It is framed. On sale for $65. 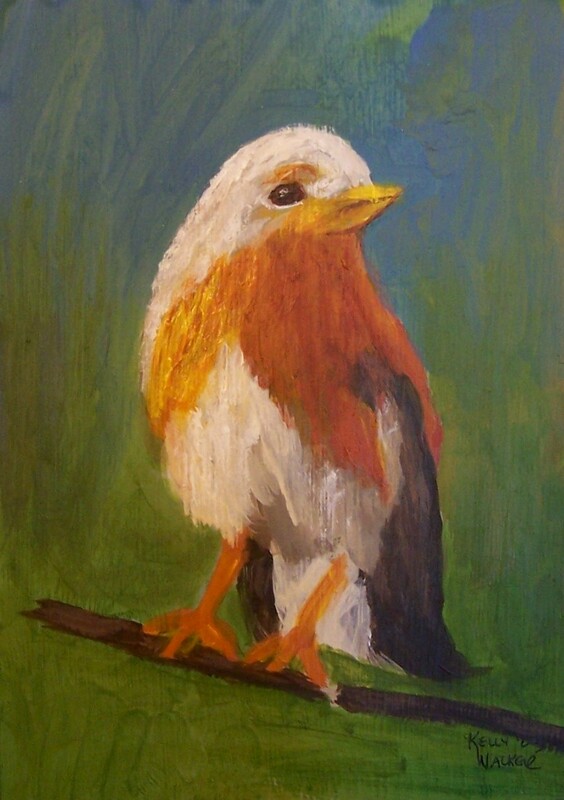 Gold Finch is a 7″x5″ oil on canvas, framed. 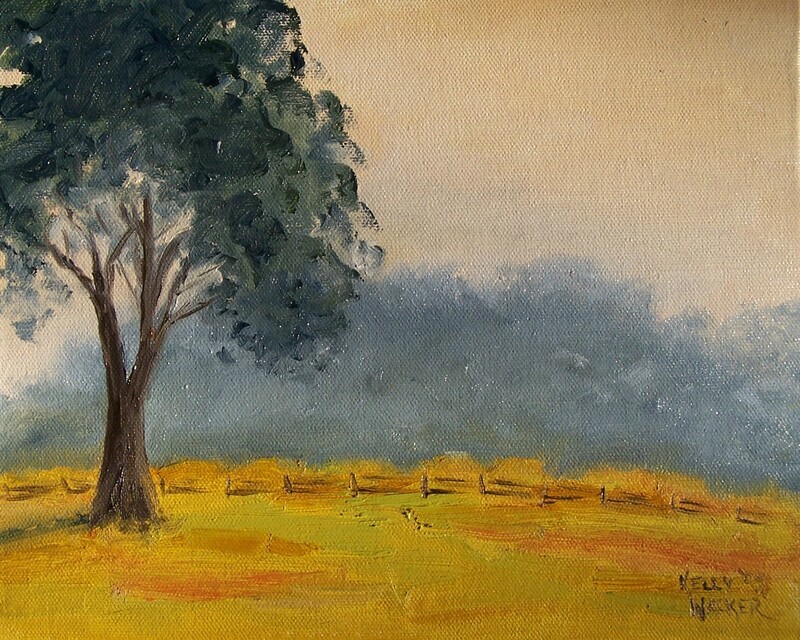 Soft Afternoon is an oil on 8″x10″ canvas. On sale for $95. 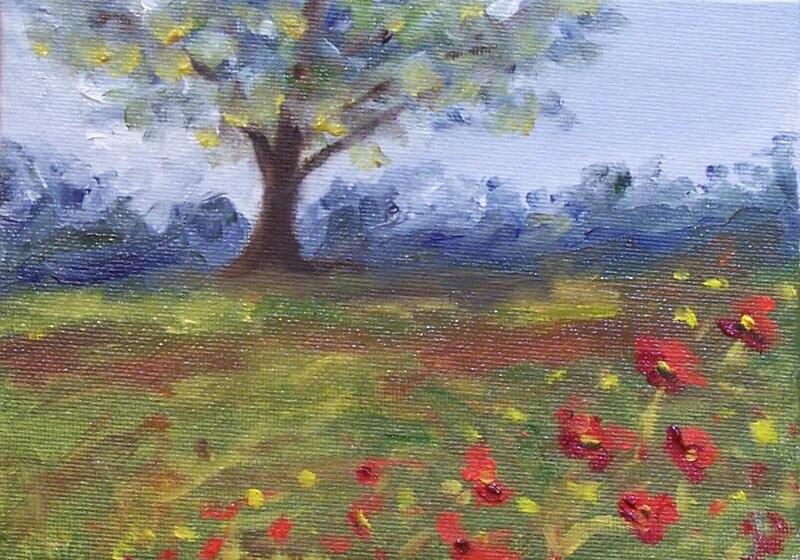 Isabella’s Poppies is an acrylic on canvas panel measuring 10″x8″ and is SOLD. 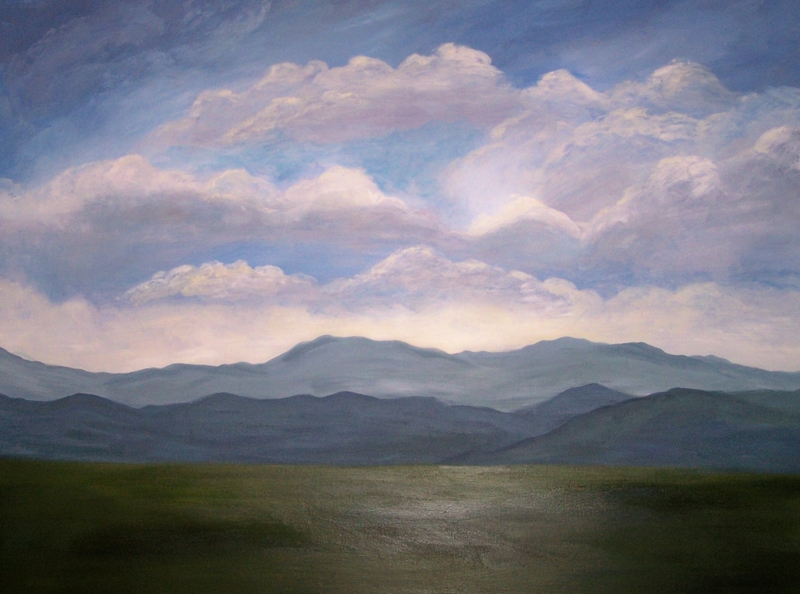 Clouds Over the Blue Ridge is a very large 30″x40″ on 1.5″ gallery wrap canvas. It is on sale for $150. All sale prices are for the unframed art unless otherwise indicated. I hope you enjoyed the winter sale. Thanks to everyone who collected art during the sale. And please feel free to pass this listing along to friends who may enjoy art. 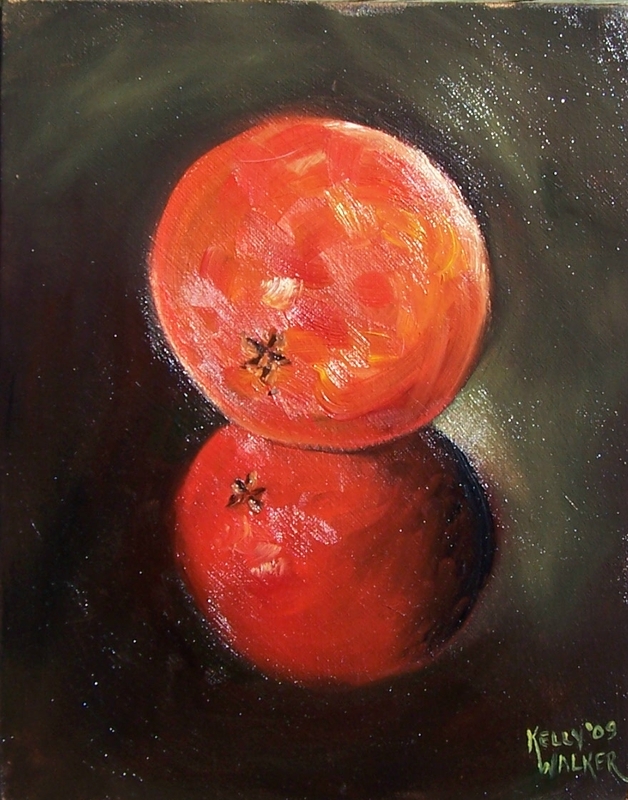 Orange Reflection II is an oil on canvas panel measuring 10″x8″ and is on sale for $85. 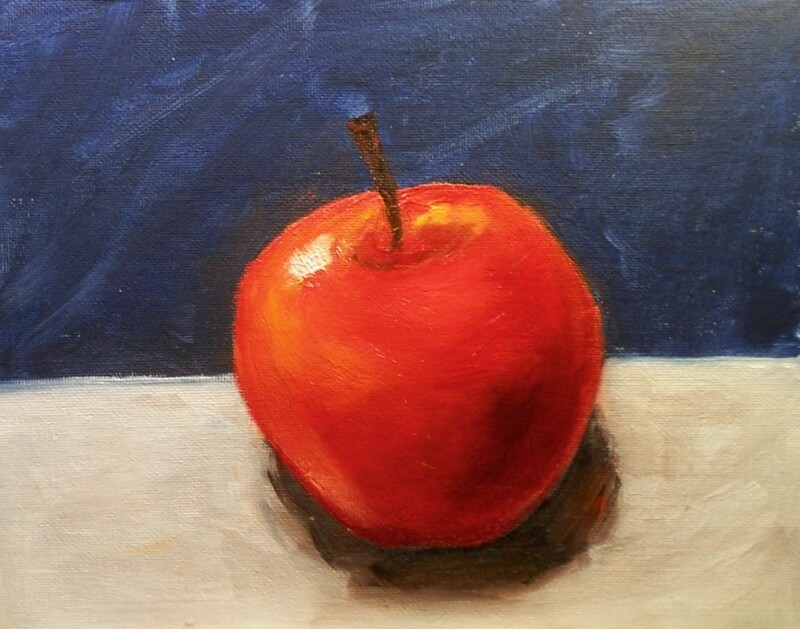 A Red Delicious is an oil on canvas measuring 8″x10″ and is on sale for $85. 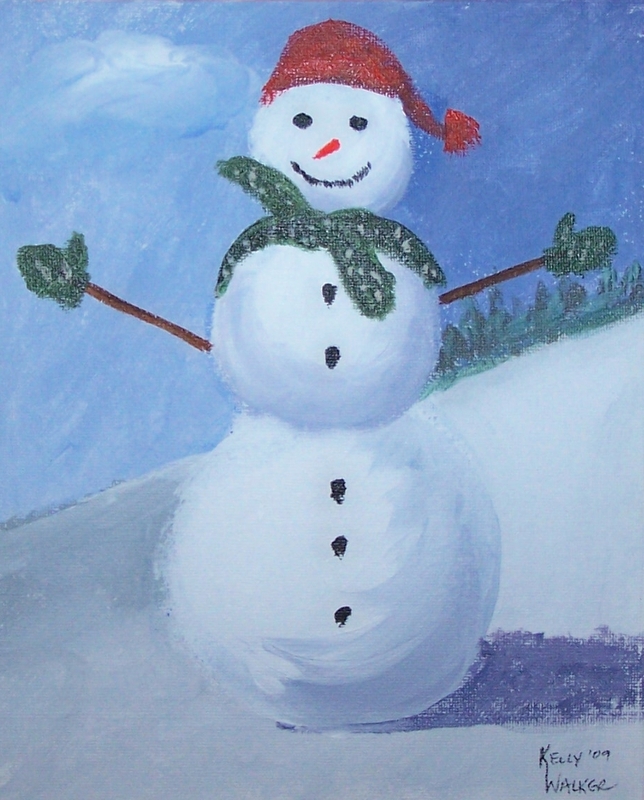 Frosty is an oil on canvas measuring 10″x8″ and is on sale for $75. 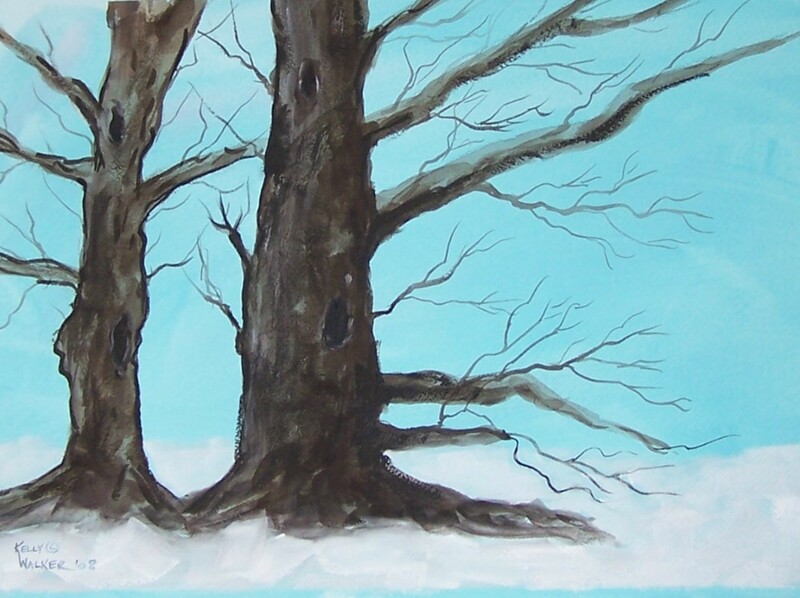 Sentinels Two is a watercolor on paper. It measures 11″x14″ and is matted and framed and on sale for $85. The Winter Sale continues. All sale prices are for paintings, unframed unless otherwise noted. 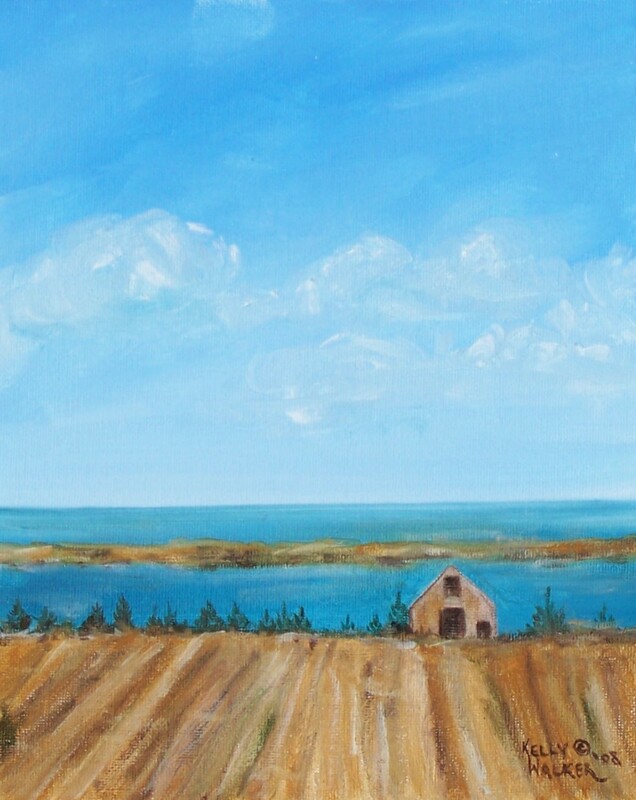 Barn on the Bay is an oil on canvas measuring 10″x8″ and is on sale for $65. 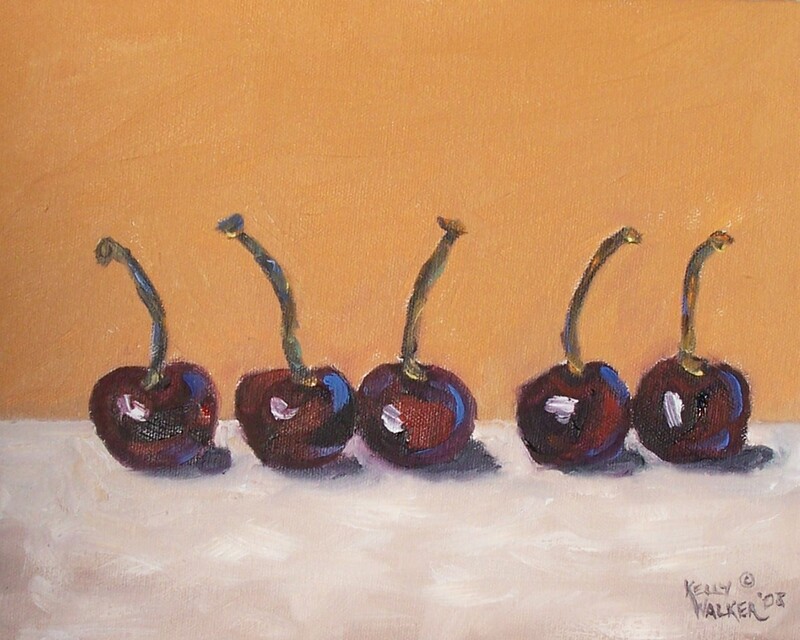 Line of Cherries is an oil on canvas measuring 8″x10″ and is on sale for $65. Field of Poppies I is a watercolor on paper measuring 22″ x 7″. It is matted and is SOLD. 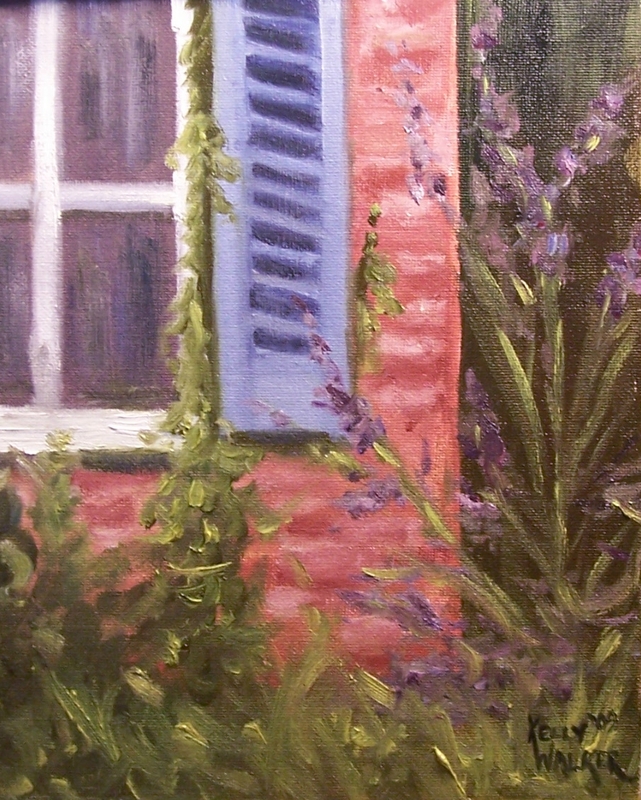 Corner of the House is an oil on canvas measuring 10″x8″. Sale price $65. 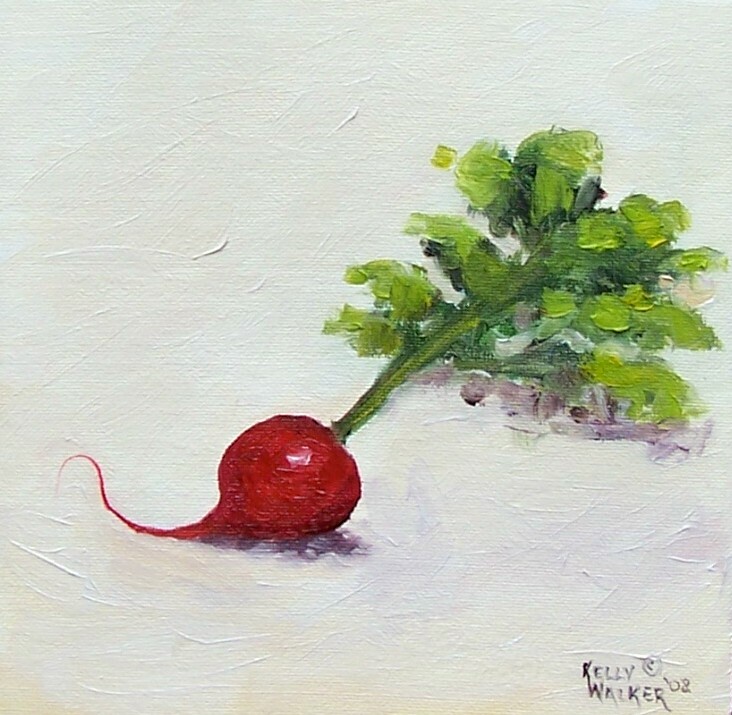 Radish is an oil on canvas panel measuring 8″x8″ and is on sale for $35. 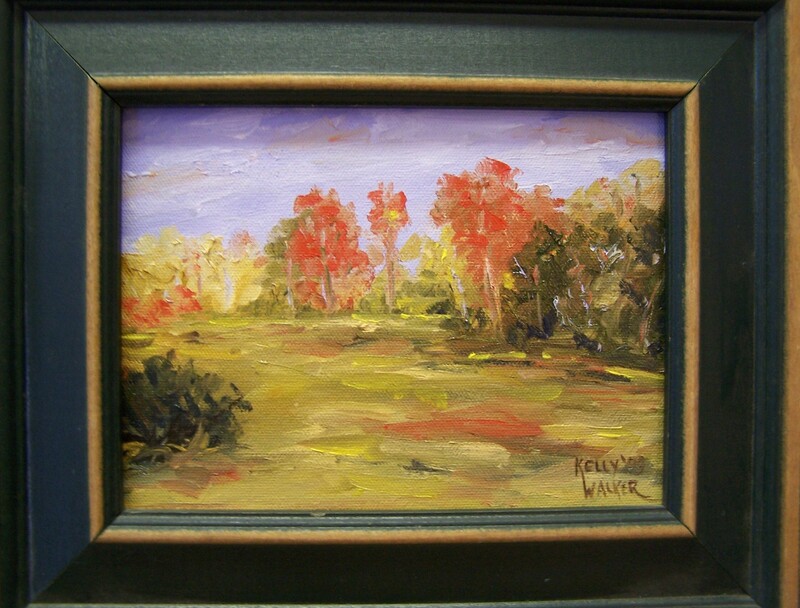 Shenandoah Fall II is an oil on 6″x8″ canvas panel. It is framed and available at Delilah’s on Main Street in Front Royal. Shenandoah I is a companion piece to this one. It was posted last month. The big winter sale starts next week!!! This is the way my table looks when I work on an abstract piece. I often work flat, not at an easel, but on a table. 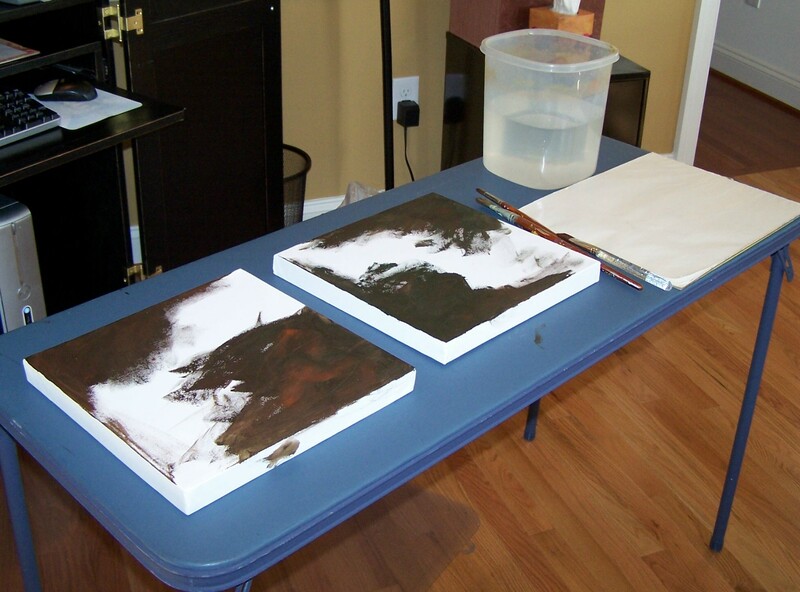 And since I usually do abstract work in acrylic it dries quickly so I want to stand over it and work fast. Not everyone appreciates abstract work. I think it is something that grows on you. Years ago I didn’t care for them either but over the years I have come to appreciate abstracts. And I really enjoy painting them. This comes directly from Wikipedia … No. 5, 1948 is a painting by Jackson Pollack (January 28, 1912 – August 11, 1956), an American painter known for his contributions to the abstract expressionist movement. The painting was done on an 8′ x 4′ sheet of fiberboard, with thick amounts of brown and yellow paint drizzled on top of it, forming a nest-like appearance. 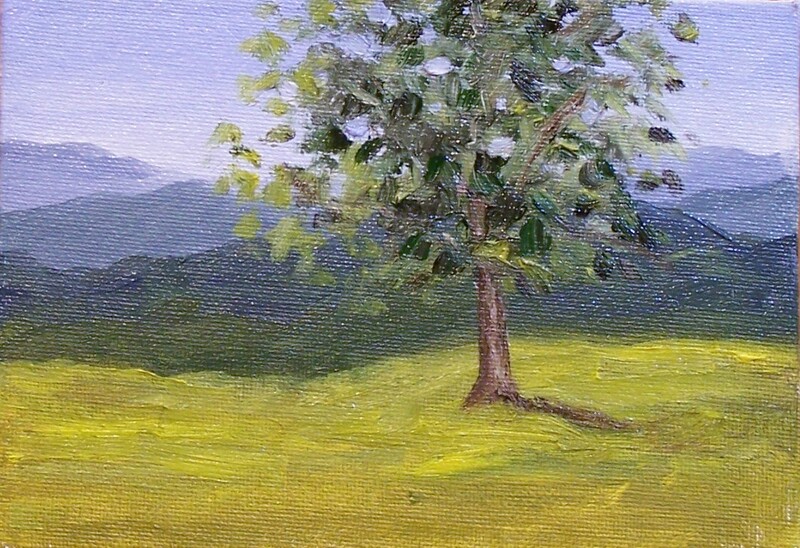 Mountains with Tree is an oil painting measuring 5″x7″ and is SOLD. 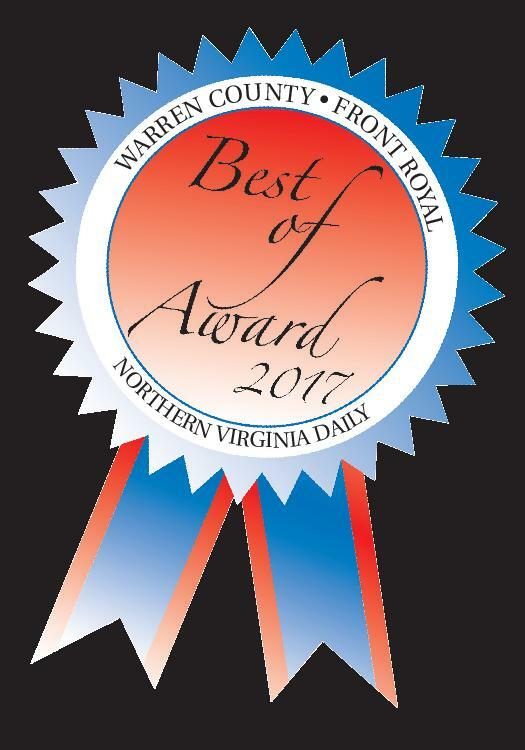 It can be seen at Delilah’s on Main Street in Front Royal. 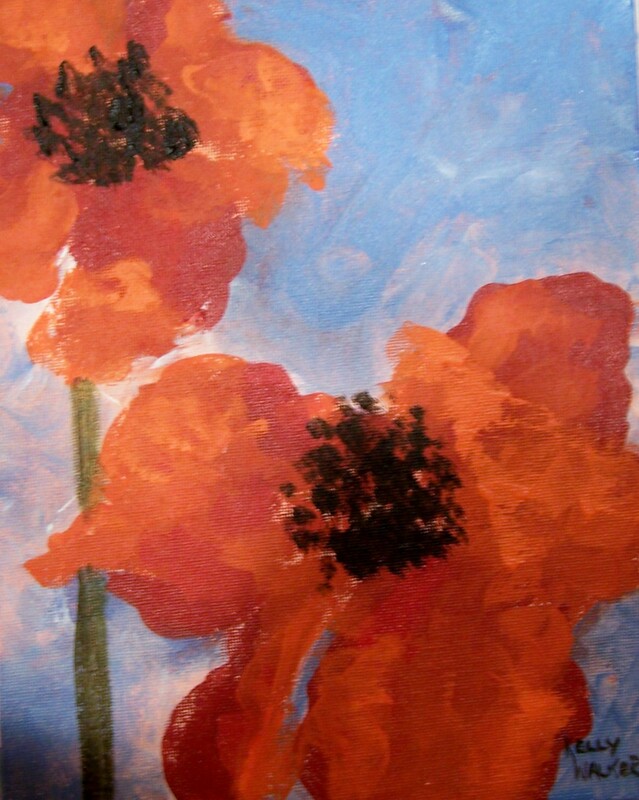 Wild Poppies II is an oil on canvas measuring 5″x7′ and is currently at Delilah’s on Main Street in Front Royal. Come by and take a look. And keep watching the blog for the upcoming Winter Sale….great bargins for art collectors!